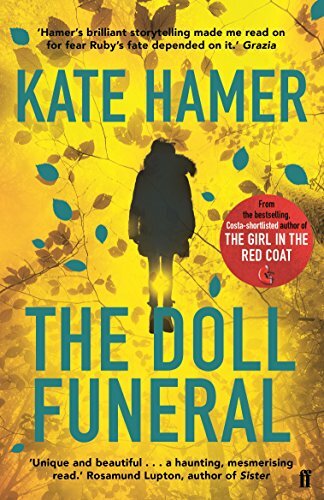 I enjoyed Kate Hamer’s debut novel The Girl in the Red Coat when I read that a couple of years ago so was really pleased to to be asked to take part in the blogtour to celebrate paperback publication of her latest novel, The Doll Funeral. The Doll Funeral is a book I find difficult to categorise. It’s not quite a psychological thriller, it’s not quite domestic drama, it’s not quite paranormal but a blend of all three which works remarkably well. Its also quite difficult to talk about without giving too much away. At the heart of the story is Ruby, a thirteen year old who has just been told that she has been adopted. Rather than this being a huge shock, it is instead a huge relief to Ruby. Barbara and Mick have never exactly been the most loving of parents, especially violent Mick, and the fantasy of finding her real parents suddenly becomes reality for Ruby. In between Ruby’s story, we also go back to 1970 and read about Ruby’s birth mother Anna, a young mother struggling to cope with the demands of married life and a young baby in a place far from home. Ruby is a most unusual girl. She seems wise beyond her thirteen years and is of striking appearance with a vivid birthmark surrounding her eye. She is quite a remarkable character with an unusual way of seeing the world. Indeed, what she can see or believes she can see is a very important strand of the book. There are quite dark themes covered such as mental illness, domestic abuse and the lines between truth and secrets became quite blurred at times. It was difficult to know who or what to trust both for the characters and the reader which made for a really intriguing read. What really stood out for me in this book was the lyrical quality of the writing. Kate Hamer has a remarkable turn of phrase particularly when describing the Forest of Dean, a place of great significance throughout the book. Through her words she created a very visual image in my head of the canopy of trees, the forest floor, the foliage throughout the seasons as well as the sounds and smells of the forest. Relationships between parents and children, particularly mothers and daughters, form an important part of the narrative and it is these relationships which really touched the emotions. It is a haunting book, full of beautiful imagery and mysteries. Kate Hamer’s first novel ‘The Girl in the Red Coat’ (Faber & Faber, 2015) was shortlisted for The Costa First Novel Prize, the British Book Industry Awards Debut Fiction Book of the Year, the John Creasy (New Blood) Dagger and the Wales Book of the Year. It was a Sunday Times bestseller and has been translated into 18 different languages. Kate won the Rhys Davies Short Story Prize and she has had short stories published in anthologies such ‘A Fiction Map of Wales’, ‘New Welsh Short Stories’ and broadcast on BBC Radio 4. She’s written articles and reviews for The Independent, The Mail on Sunday and The New York Times. Kate grew up in the West country and rural Pembrokeshire and now lives with her husband in Cardiff. Her second novel ‘The Doll Funeral’ was a Bookseller book of the month and an editor’s pick for Radio 4’s Open Book. That sounds like a lovely literary fiction. Good review–thanks!